The School of Education at the University of the West of Scotland, in partnership with the Holocaust Educational Trust, with the endorsement of Interfaith Scotland, and the support of Education Scotland are pioneering a schools’ programme in Scotland that promotes sustained and effective Holocaust education, and is responsive to our distinctive curriculum. Grove academy is one of the pioneer schools in Scotland with its commitment to Holocaust Education. As such Grove Academy, along with only two other schools, was awarded level 1 status and are already working on the level 2 status. 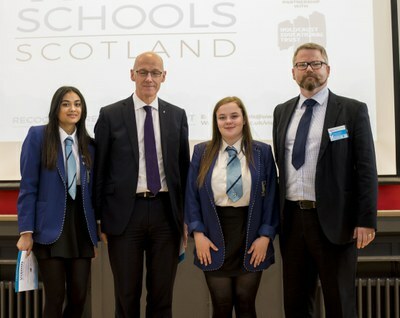 2) Exercised good practice of a sustainable approach to teaching the Holocaust (over a minimum of two consecutive years), with a clear focus on meaningful connections with curricular areas in accordance with the purposes and principles of the Scottish curriculum. 3) Demonstrated an ethos where responsible citizenship is encouraged to actively address issues raised through Holocaust education. 4) Shared and developed good practice with peers, practitioners, and/or organisations, e.g. the Holocaust Educational Trust, the Holocaust Memorial Day Trust, local libraries and museums. 5) Identified Continued Professional Learning in Holocaust education.